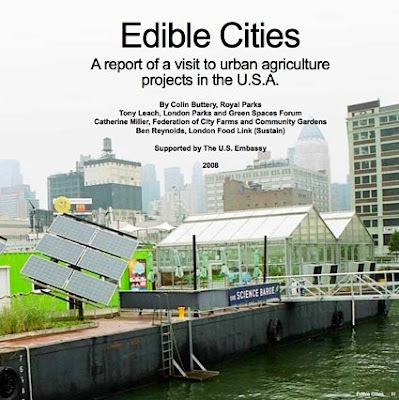 One worth some further elaboration, Edible Cities featured a group from the UK did a study of US-based urban agriculture projects entitled (the report is available here) which "...shows edible cities are the future - Edible Cities, looks at examples of urban agriculture projects in cities and identifies a series of opportunities that other cities could be adopting." 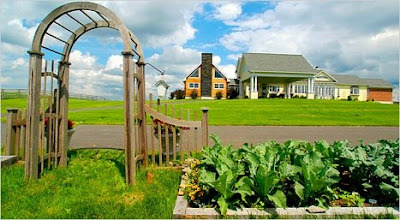 The report summarized a number of topics and opportunities, from SustainWeb: "A commercial element to many of the US projects, which is much less common in the UK; A more liberal situation in the US than in the UK to encourage composting, but less willingness than in the UK to include animals in some urban agriculture projects; Different approaches to fencing and public access to projects, which varied within the US, depending on context; Imaginative and productive ways of growing without access to subsoil, either in raised beds on hard surfaces or, in one case, in hydroponics on a barge; Inspiring use of an holistic and sustainable approach to fish farming in an urban area which produces marketable quantities of tilapia." Also included were ideas on promoting food production in cities, again from SustainWeb: "Using the many possibilities of urban tree planting to promote traditional varieties of fruit and nuts; Untapping the potential of both Royal Parks and other parks to accommodate some food growing in their grounds; Exploring under-utilised spaces such as derelict council property, private gardens and social housing to grow food; Making use of the abundant buildings in urban areas to grow food on rooftops, up walls and in window boxes; Building on the food growing expertise that already exists in a multicultural community, as well as providing education and training for new growers." The materials are available for download, with a suggested donation. I have yet to delve into the report in any detail, but it definitely sounds promising. A cross-post from the concept thrown out by _urb_ on Agro-urbanism... as well as the original post - which has some comprehensive thoughts to check out. One quote worth repeating: "Luckily, architects, landscape architects, and urbanists have been planning for this type of situation. There have been many proposals in the last couple of years for different types of agricultural based infrastructures that can be integrated into nurban areas, what I am calling AGRO-URBANISM. The impetus for these proposals are manifold and include the concerns previously mentioned as well as issues of sustainability and sustainable development, a re-positioning of the landscape architecture discipline and the rise of the hybrid discipline “landscape urbanism”, and recent trends in architecture focusing on performance-based design which derive inspiration from ecological and biological systems." 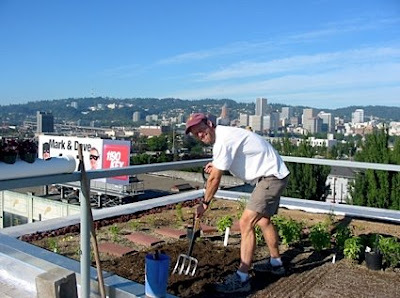 A local project worth checking out is the Rocket Restaurant here in Portland, of which City Farmer had a long post from rooftop gardener Marc Boucher-Colbert. 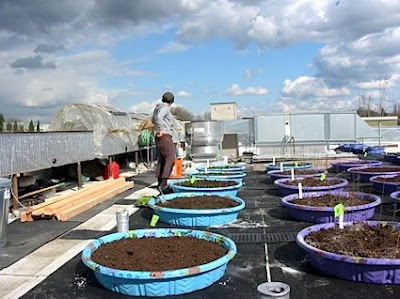 I mentioned this previously, but this article talks in detail about the trials and tribulations of rooftop ag on this innovative project, along with some more photos. Some interesting background on the concept of rooftop agriculture, via Marc: "The Austrian architect and painter Hundertwasser, who seemed like he was one not to mince words, said something to the effect that by building a structure, one murders the biotic community there (pretty much true, as far as I can tell), and that, therefore, one has a moral obligation to plant the roof and restore what one has killed." The main thrust of a number of theorists is the idea of reclaiming land within the urban core for agricultural purposes. An article from March in the Guardian on Middlesbrough posits this as well, saying: "All over the town, disused urban spaces were turned into fertile corners bursting with freshly grown fruit and vegetables as more than 1,000 residents." 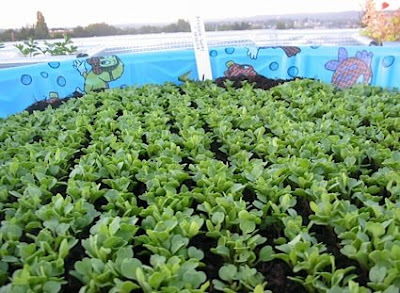 I've mentioned the project before, as well as directed people to the work of David Barrie (and his wide-ranging blog) but it becomes the crux of urban agriculture. Definitely more to come... as it's still a hot topic.